Just to confirm. This does not support variations? Hi Michael, I’ll look into this today. If it does not already support variations I’ll get it in immediately. I am using Jigoshop Export v1.2.3 and Jigoshop Product Import Deluxe v 1.2.6 and neither product exports product attributes. I thought that issue was going to be addressed in the latest versions. Hi Salem, we’re re-cooking this Plugin to support progress bars as well as a memory limit override to allow for large store catalogues (8000+). We hope to release this shortly after our next Product Importer Deluxe update. 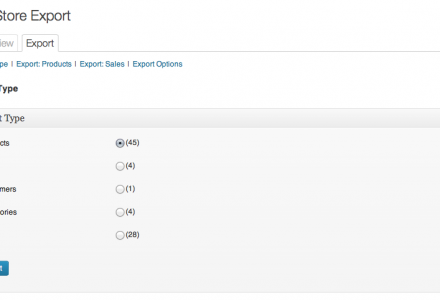 How to export the product shipping fee base on international delivery shipping method with shipping class? Thanks! I used the exporter and it wiped out all cases where I used “>” as the Product Category heirachy delimiter. Does anyone know how I can work around this? Hi Meghan, I’ll reproduce this and get a Plugin update out for this. 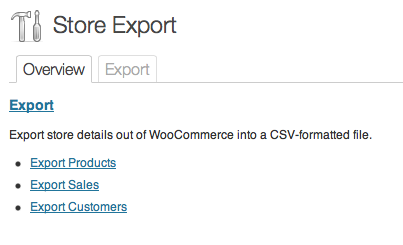 Can you please confirm that this is happening on the WP e-Commerce release of Exporter or not? Thanks Meghan. Works great – fast and flawless! Now if he can only get it to work for Jigoshop! I need help soon, please. I purchased the Product Importer Deluxe and imported my products, but now I need to export the entire store so my client can assign tags. I purchased the Importer after manually loading a portion of the store, so I do not have all of the products compiled into one place and I really need that. I just updated to the latest version and both the category and tag export work perfectly, but I’m still receiving the same fatal error on the Product export. I’m wondering if something with my data is causing the issue. Hi Jamie, can you paste the updated error. I fixed the issue you were experiencing, it could be another one has cropped up. Thanks Jamie. Will there be an update for this plugin soon? There are not many exporter plugins for wp e-commerce. This one is promising, I have been using it successfully but only but by modifying it. I’m sure it could even fetch a few dollars if it was rock-solid and worked out-of-the-box with Custom Fields. Hi Andrew, I’m looking at this Plugin today and expect a Plugin update over the weekend at the latest. 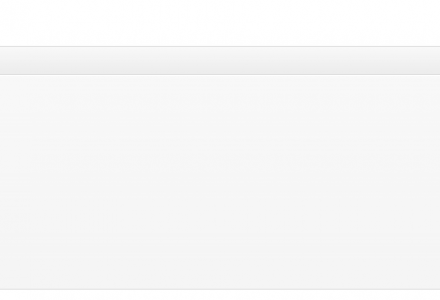 This is such a brilliant extension for the brilliant e-commerce plugin..
so I’ll be happy waiting for the update of the stable release..
the one that works… that compatible with the latest version of Woocommerce . Will you be releasing an update at all? 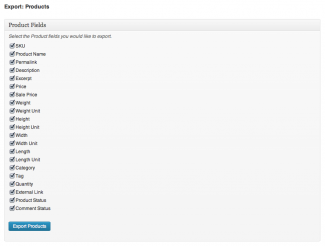 Hi Ashley, this is sorted in the latest Plugin update. 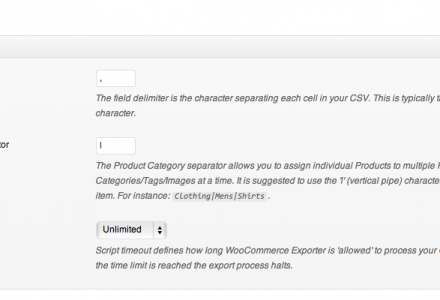 Open Products > Store Export within the WordPress Administration. maybe also an option to have a copy of the file on the server, not just to download. 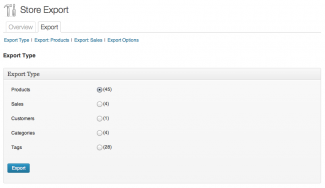 Hi, i am really interested on using the export plugin in order to make changes in my products attributes and to be able to import them again. The main issue I have is how to export more fields, it will be great if the plugin will allow you to map fileds to the CSV and create your own custom export. I know you work on it and you will enhance the plugin, I just need it really quick and I wonder how I can change the code a bit to retrieve custom attributes of a product (how do I query product attributes? 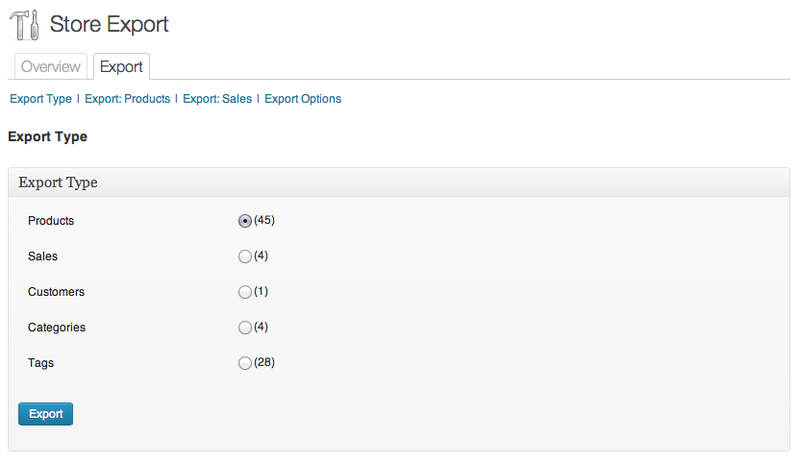 ), if you give me a lead on where to look or example of the custom attribue code that I need to add, it will be great! The main issue I have is how to export more fields, it will be great if the plugin will allow you to map fields to the CSV and create your own custom export. I know you work on it and you will enhance the plugin, I just need it really quick and I wonder how I can change the code a bit to retrieve custom attributes of a product (how do I query product attributes? 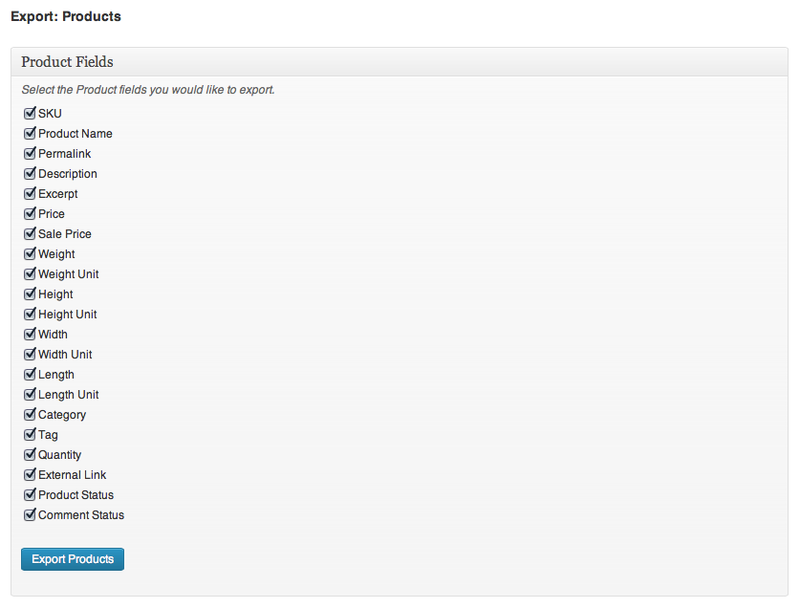 ), if you give me a lead on where to look or example of the custom attribute code that I need to add, it will be great! Don’t bother with this plugin. 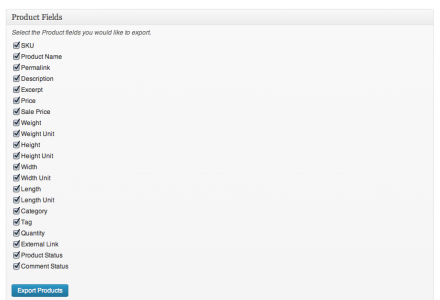 It doesn’t work, and repeated attempts to contact the developer for support get no response whatsoever. Will just have to try and find something else.